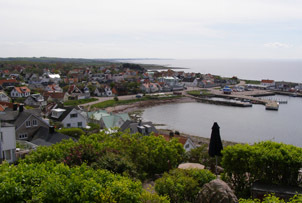 The Grand Hôtel Mölle is located in the north west of Skåne at the end of the Kullaberg Peninsula, and has two restaurants, Maritime, their gourmet restaurant, and Seaside, their new restaurant. 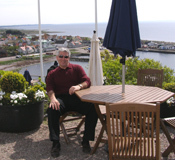 This being Sweden, where just the mere hint of a warm, sunny day, has the Swedes running outside to dine and soak up the sunshine, had Edward F. Nesta and I eagerly doing the same during our visit in May 2008. 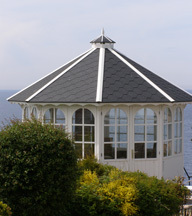 Although the dining room at the Grand Hôtel Mölle is lovely with its turn of the century ambience, the terrace of the restaurant, Seaside, was calling us with its siren song of the sea. White petunias lined the white flower boxes that graced the building, boxwood stood neatly in cast iron pots, white petunias lusciously spilled over black pots placed on a stone wall, teak chairs and octagonal teak tables with blue and white striped market umbrellas were placed on small gravel stones, a gazebo stood to the right of the rolling expanse of gardens and lawn that led down to the rocky coast of the harbor below where colorful houses dotted the coastline with boats moored at the dock. 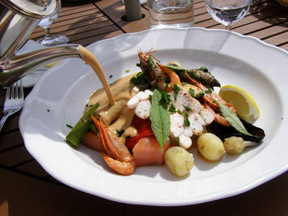 There is something very special about the light in Sweden, and we sat in the bright sunshine at a teak table and feasted our eyes on the spectacular beauty of the Skåne region before experiencing the gastronomy for which this area is famous. Our lunch began with delicious homemade tomato bread and butter to accompany a Tomato Salad, made with red and yellow tomatoes from the tomato farm Vikentomater, which we had visited earlier in the morning, along with mozzarella, fresh herbs cut from the restaurant's herb garden, thinly sliced red onion, and boiled egg halves, garnished with Parmesan cheese crisps and pinenuts. 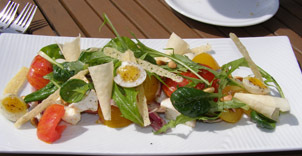 The course was attractively presented on a white rectangular plate with the tomatoes at the perfect ripeness and whispered the word "summer" in every delectable bite. For our second course, we had new potatoes, the first of the season, which the Swedes highly prize not only for their delicate taste but also for their announcement that summer has indeed arrived, to accompany a gorgeous fresh taste of the sea with salmon, shrimp, tuna, calamari, asparagus, and eggplant, garnished with fresh sage and chopped chives from the herb garden, with a rich sauce served in a silver pot to generously or sparingly drizzle as we liked. Although the restaurant had some lovely desserts, we were more than satisfied with our appetizing 2-course lunch. Afterwards, we strolled through the colorful gardens where the intoxicating perfume of lilacs gently perfumed the air, and enjoyed the stunning view of the harbor and the fishing village. Seaside is open Thursday - Sunday. 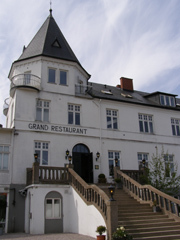 The Grand Hôtel Mölle is located 35 km (22 miles) from Helsingborg and the ferry crossing to Denmark, 95 km (59 miles from Malmö, and 220 km (137 miles) from Gothenburg, Sweden.